I spent the first beautiful weekend of summer in Ithaca, NY. Between hiking, ultimate frisbee, and yoga, I had a little bit of time to check out the local food co-op and grocery store. Ithaca is home to a thriving vegetarian scene, including the landmark Mosewood Restaraunt, so I couldn’t wait to try the locally made organic tofu I found. Each individually-wrapped, golden brown block of Ithaca Soy Tofu-Kan cost around $2.00, and came marinated, baked and ready to eat. Monday night I participated in the pro division of the Brooklyn Kitchen Third Annual Cupcake Cookoff. Although I did not take home the title, it was more than worth the week long preparation that went into my three entries to meet such cool people and feel the thrill of competition running through my veins for the first time since, I dunno, my JV basketball tournament in 10th grade. Originally, I planned to make cupcakes that could compete in the exotic flavor category. But two days before the competition I found out that as a pro, I was not eligible for any of the themed categories. I would be competing against 5 other pros in a “may the best man win” battle. I went ahead with my exotic themed cupcakes, which may have been a mistake, since the cupcakes that won–while super yummy–were more traditional. A crowd favorite, all 3 batches of my Sweet Potato Cupcake with Chai Buttercream, Chocolate Rum Drizzle and Pistachio disappeared halfway through the competition...the first of any of the 5 pro competitors! My idea for the Sweet Potato Cupcake with Chai Frosting came to me days before the competition. It popped into my head while I was in the shower. I was so inspired by the host of my new favorite cooking show I decided to make up a recipe of my own. Here is a breakfast I made that is a cross between Japanese egg custard soup with fillings and good ol’ poached eggs. It may seem a bit fussy, but trust me, it is worth the effort. This meal was gone in seconds. The preparations began a few days ago, when Marcela emailed me with the idea and I ran to my bookshelf and pulled out my 1968 edition Latin American Cooking by Time Life Books. 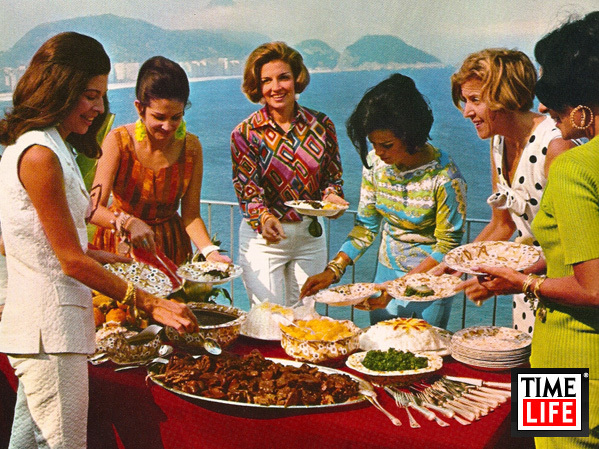 Elegant Brazilian Ladies enjoy a feijoada completa. I remembered there was an entire section on feijoada, because of the picture above. This image had made a big impression on me because I’d bought the book right after freshman year of college/Latin American Sociology 101, where I’d learned all about the brutal military dictatorships and economic disparity of that era. So I always narrowed my eyes a little at these fun loving, aristocratic ladies. It’s funny to think back on it now. One winter break later, I visited my sister who was studying abroad at the University of Sao Paulo. We paid a visit to her friend Thais’ family in Rio, who had a terrace just like the one above where we welcomed the year 2000 with lots of dancing, triple kisses (one on each cheek is NOT ENOUGH), and a feijoada – just like the one in the book. Since I was vegetarian, my favorites were maioneise (mai-yo-nay-zee), a Brazilian potato salad with peas and egg; and vinagrete (vee-nay-gret-chee), a Brazilian condiment that is similar to pico de gallo. Their names were also so darn cute and fun to say. The plan for the party was that I would make Sky’s birthday cake on Thursday. On Friday, after dinner with Sky’s parents, Marcela and I would make the beans, vegan maioneise and mango vinagrete. On Saturday we would finish up- Marcela with the rice, and me with my Colombiana touch: tostones and maduros (savory and sweet fried plantains). The party would start at 3:30pm and at some point we would throw some fish and pineapple skewers on the grill. One Brazilian…one Colombian…a Latin feast. As the day of the party approached – like a size 2 dress on a size 6 mamasota dancing samba – the seams of our tidy little plan began to unravel. I was craving mushrooms last night, and not just any mushrooms- RAW mushrooms, as in unabashed fungal goodness. I decided to add mushrooms to the somewhat run-o-the-mill cucumber salad I was planning, to go with some simple roasted eggplant and oven-warmed pitas. The results were completely satisfying, as the mushrooms gave the salad a richness and depth (like cheese!) to counterbalance the cool neutrality of the yogurt and cucumbers. Yum. Combine all ingredients in a medium bowl and toss. Serve immediately. Alternately, whisk together the dill, lemon, vinegar, oil, salt and pepper and chill all ingredients until ready to serve. Before serving, combine the other ingredients and toss in dressing. Note: the longer you let the salad sit, the more marinated the mushrooms will be. This can be good: if you want a richer flavor, or bad: if you want the “crunch” of crisp mushroom slices between your teeth. I recommend you have one serving right away, and then another later, so you can have the best o’ both ‘shrooms! This would also go well with grilled meat…kebabs, lamb burgers. I had it and loved it with a veggie burger, too. *UPDATE* The Nation’s only mushroom museum, in Kennett Square, PA, (the “mushroom capital of the world“) has closed! When I was 13, my Dad took me there during one of our frequent, post-move road trips from D.C. to Pennsylvania. All I can remember is watching a video of a worker shoveling manure onto shelves in a dark barn and a time lapse video of mushrooms growing on it. After a moment of revulsion, we went out for a mycelian feast at a local inn that specialized in dishes featuring buttons, portabellas, oysters, criminis, shiitakes… I had linguine with mixed mushrooms. It was my first moment of Pennsylvania pride! Recently, I noticed that a package of Brooklyn vegetable stand mushrooms I was opening was from Kennett Square (sigh). Rest in peace, mushroom museum. I invented this a few months ago and have since been perfecting my secret recipe. Now it’s time to share it with you! This quiche is inspired by the Mexican corn served at Cafe Habana’s rollicking Sunday brunch (without the mayo), and also elotes, the beloved cups of hot steaming corn (the red cooler in a grocery cart variety) that warmed my walk home when I lived in Hamilton Heights. Corn was my comfort on those chilly nights, and I figured it would work well in quiche, which is also a part-comfort (a la cup o’ corn) part-party (a la Cafe Habana) food. This particular one sells well at Phoebe’s, especially now that the weather is warming, because grilled corn is a BBQ-type food and reminds us of summer and being outside.